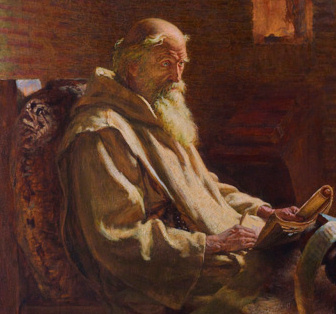 Saint Bede the Venerable – Muslim Museum UK – Uncover the 1400 year relationship between Britain and Islam. Explore the history and heritage of Muslims in Britain. Bede (673–735), also referred to as Saint Bede or the Venerable Bede was an English monk, scholar and writer based in modern day Northumberland, Northeast England. His most famous work, Historia ecclesiastica gentis Anglorum (The Ecclesiastical History of the English People) gained him the title “The Father of English History”. 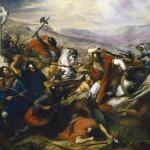 The earliest perceptions of Islam in England were seen through a ‘Christian’ perspective. Bede wrote of Muslims and Islam, informed and influenced by older writing of St Jerome (342-420) who wrote of ‘Saracens’ as the ‘other’ in the pre-Islamic era. Having not met a Muslim he wrote of Muslims as ‘uagos, incertisque sedibus, exosi et contrarii’ – undifferentiatedly shiftless, hateful, aggressive (see Katharine Scarfe Beckett, Anglo-Saxon Perceptions of the Islamic World, 2003). However, on his deathbed, he distributed his belongings. Bede’s treasures included pepper and incense which were products from the Muslim World.